All the wild frenzy of the U.S. presidential election comes down to today. I’ve been blogging about it almost non-stop lately, but today it’s time to shut up and go vote. And then spend the rest of the day in a state of unnerved distraction, trying not to reload your favorite news site every 10 minutes (oh wait, is that just me?). So today I’m launching an election distraction: The Stephanies is now available. You can go buy the print version, the digital version or the “color-your-own” version where you (or your kid) can be the illustrator. It’s great fun. If you’re into children’s books, think more Robert Munsch than Margaret Wise Brown. This is the book my 6-year-old daughter and I wrote together and then published through a successful Kickstarter campaign. Proceeds from the original Kickstarter campaign went to Lexi’s college fund, but for the month of November we’re going to share. 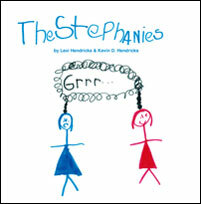 Half the profits from The Stephanies will go to First Book, an organization that gives kids in need access to books. I’d be remiss if I didn’t send out a big thank you to everyone who backed our Kickstarter campaign and made this project possible. Thank you! I hope you’ll check out the book, give it a review on Amazon and tell your friends. Thanks!